Cape Town - Sharks wing Makazole Mapimpi says he is not paying any attention to the Springbok hype surrounding his 2019 Super Rugby form. The 28-year-old has been superb in this year's tournament so far, scoring four tries in seven matches and having looked consistently dangerous with ball in hand. A natural speedster, Mapimpi has forced his way into the Springbok conversation with many critics believing that he should be part of Rassie Erasmus' plans for the 2019 World Cup in Japan. S'bu Nkosi and Aphiwe Dyantyi were the Bok incumbents in 2018, but this year Mapimpi has put his hand up and now looks good to add to the four Test caps he earned himself last year. "I'm not thinking about it," he said firmly on Tuesday when asked by Durban media about his World Cup prospects. "Obviously everybody wants to go to the World Cup, but I'm focusing on my game. I have to keep improving. "I'm happy with my form but I need to work hard to keep moving forward." 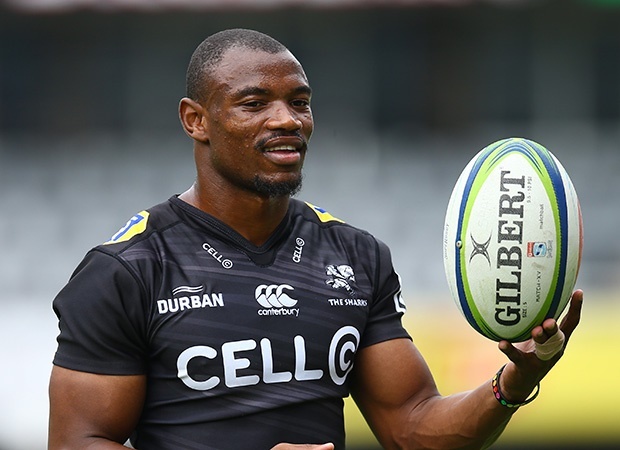 Mapimpi believes one of the main reasons for his form this year is that the Sharks are getting the ball into the outside channels more often. That much was evident in their resounding 42-5 win over the Lions at Ellis Park this past Friday, and Mapimpi's try in that match when he was released by Curwin Bosch was a thing of beauty. He knows, however, that there is still a lot to work on. "I was playing centre when I was at Border back home and I didn't play on the wing," Mapimpi explained. "I need to improve under high balls and with my tackling technique ... I wasn't good under the high ball when I was with the Boks in camp and coach Rassie spoke to me about it, so I started fixing it." The Sharks take on the Jaguares at Kings Park on Saturday.